for my friend Angela and her husband, Devin. $32 for the 6" tray, flat $4 shipping. In a variety of colors, in my shop now and in the coming weeks. Thanks for helping me help my friends get back on their feet. It is a foggy foggy morning- I'm in a quiet hotel room and all of my family is asleep after a late night at my cousin's wedding. 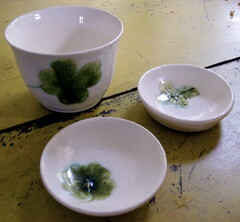 I'm thinking about pottery- specifically picking up a box of porcelain and some new white glazes to test. I'm still having problems with glaze shivering off the edges of my pieces- it seems to happen at random, and even though I've switched glazes and even the formulations of the glazes, I think I'm ready to try a new clay. Maybe it's the clay that's been reformulated rather than the glaze? I've been yearning for porcelain for some time, but my normal clay supplier, as wonderful as they are, doesn't carry much in the way of porcelain. They have 2 that I've tried but once finished, there's not a perceptible difference between it and the smooth smooth stoneware I usually use. So, that's tomorrow. Last week my boy was sick, sick, and I focused on tending to him and delivering pots rather than making anything new. 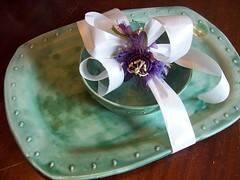 I boxed up twenty little cups and saucers for my friend and client, Lane. I finished the botanical dinnerware set, finally, as well as the bowls for another client who's ordered her dishes by component. I also delivered all of my bee pieces. I spent last Saturday hanging them on the wall of my dining room and shooting them. I'm really really proud of them and can't wait to see how they look all hanging together at the same time. This is a set of 8 small dessert bowls I threw on the wheel and decorated. Honestly, if they don't sell, I will be more than happy to keep them. I'm just tickled with how they turned out. And this is a detail shot of one of my larger bowls. It's a slab piece, one that Natalie made for me. She really has been invaluable- she and I worked and worked on figuring out how to use the honeycomb foundation to make a nice impression before we laid the enormous, heavy slab into its mold. I inscribed a bit of Emily Dickinson's poem 58/"the bee" into the side rim. All of these pieces hang on the wall- either with traditional plate hangers, small holes I drilled into the foot of the piece, or little lug loops I added to the backs of the larger platters. I'm ready to begin working and throwing again. I have very little inventory. 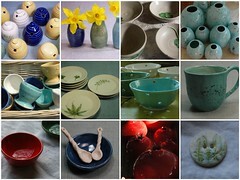 Mugs and bowls are platters and ornaments for the holidays are on my to-make list, as are travel cups. A friend found some silicone lids for her mugs in her etsy shop. I'm on a search for some lids to make cups to locally. This week I'm finishing up my "hope" pieces for the St. Jude event- hopefully early in the week. 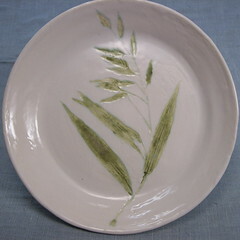 I'm motivated to clear my plate and emerge from the land of "swamped" and start being creative again. good morning. has the back-to-school business set in for you yet? social events, sports, charity? It certainly has over here. I have one special event I'd like to tell you about today. Amazing Grace (sorry, it's a facebook link) is a fundraising event for a family that is dear to my heart. My friends Wendy and Kalki adopted a sweet little girl a few years ago. She has Pierre Robin Sequence and has had 16 surgeries in her short 5 years. She's scheduled for two more in the next two months. You can only begin to imagine the expenses associated with that many surgeries. I can't wrap my head around it. Some friends of the family have gotten together to arrange a large fundraising party tomorrow night at the Trolley Stop Market, my good friends' store and restaurant. $10 donation gets you in the door- unlimited pizza and entertainment, and there's a large silent auction filled with gorgeous works of artists (musicians, writers, and visual artists) and artisans. This is the piece I made for the event. If you're in Memphis, I'd love to see you there. If you're away, look around on the facebook page, and if you feel like giving, I'd thank you. Have a lovely week. I've got more things to tell you later in the week, but for now, I'm off to help with this event. A few Sundays ago I had a little flash of inspiration in the middle of the Sunday sermon. It was a very thoughtful sermon by our vocational deacon whose emphasis is social justice and outreach. He cares, in a very tangible way, for the "least of these" among us. The poor, homeless, mentally ill, and handicapped. The people of Haiti have been on this list for much, much longer than these same people have been in our national conscience. My parish has been a part of the Haiti Partnership for some time- sending food, medical missionaries, and money to Haiti, and in particular, St. Vincent's school and hospital in Port-au-Prince. This school primarily cares for the poor handicapped children of Haiti, many of them orphaned or abandoned. They provide food, shelter, education, and prosthetics for over 300 children. I'm sure that a lot of people are beginning to have a bit of Haiti fatigue. They've given a little or a lot. You all have helped me give more than I thought I would be able to. But I don't want to forget. I have a home, food, clothing, savings, insurance, working limbs, and as much clean water as I could ever want. My concerns are minor. I am blessed. I have hope. I want these children to have hope. In that sermon, the word HOPE kept flashing in my mind. I made a small sketch and that afternoon made a few test pieces. Three of five made me happy. I plan to make more of these, and I plan to keep making them. 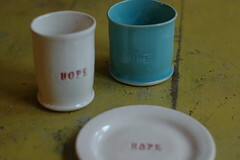 As with my last project, 60% of the sales of these HOPE pieces will go to Hatit, through the Haiti Partnership . I don't mean to be sanctimonious. But I don't want to forget about those who can't help themselves. 2/16- I should mention that I haven't listed these yet because the plate needs a little glaze touch up and these three are all I have. I'll let you know when they're ready for the shop! thanks for your enthusiasm! 2009 has been huge, and in so many ways. It has been a year of a lot of growth. We've definitely felt both the thrills of accomplishment and hurt with those growing pains. Professionally, the year has been incredible. Since I quit my part-time art education job at a wonderful museum, my time for pottery has expanded exponentially. So did my sales. I haven't started the grand tally, but I more than met my 2008 sales in November and December. To have sales like that during such hard economic times is nothing short of miraculous. This year I've tried new forms and new colors- egg forms, more lidded vessels, buttery bells, buttons, pomegranates- and turquoise! red! Still working on getting that green to cooperate. And if last year was the year of the berry bowl, I'm not sure what this year has been, because I've made and sold well over 100 of them. Etsy sales have been wonderful, and my facebook page has surprised me with its activity. I've taken some wonderful trips this year and met some wonderful friends- Dana of House of Roux in the early spring, a girls' weekend to New Orleans and a train ride with the Bundren family, and a fall trip to visit some very good friends. Not to mention the wonderful friends I've met through this blog and flickr. And seeing the Dalai Lama! Live! In person! A new school filled with old and new friends for my boy. New babies for dear friends and a brand new nephew. There's been loss- dear friends and family have moved away. Permanent losses of my mother in law, a very dear friend who had been struggling for years. We've joined the ranks of the downsized and are looking, hopefully, in new directions (and in light of that downsizing, so so thankful for our joint capacity for freelancing and those aforementioned pottery sales). I'm hopeful for what 2010 will bring. I've signed up for a late-summer workshop with my mentor and will take the opportunity to visit with some college friends I haven't seen in a dozen years while I'm in the area. I'm adding dates to the Memphis Farmers Market and St. Jude's monthly-to-quarterly market. 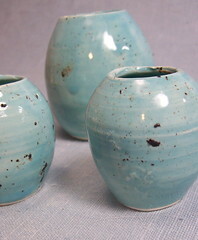 I'm already thinking about new forms I want to play with and techniques to refine (namely, how to make the speckled egg glaze work in fewer firings). I'd like to work bigger and better. And I'd like to have enough work made from January-May that I can take the summer "off" from production and firing- both for the sake of my air conditioning (old house=old wiring) and time with my child. So here's to learning from our past and anticipating the future. And here's to living in the present. Happy New Year's, everyone. Wow. I am so, so grateful to all of my friends and customers who came out to my house this weekend for the sale. My expectations were exceeded more than I can even tell. They were blown out of the water. And even better, I still have about half of my work to carry me through to my next 3 sales on Dec 4, 5, and 10. The kiln is full again, slowly heating up to bisque a new set of pomegranates, platters (because I'm slap out of both of those) and the promised etsy berrybowl restock on Friday. The first year we were in our house Gary built a wall of bookshelves in the living room, facing the fireplace. We ran out of space on them almost before they were finished. We love our books and find that we have to cull the collection quarterly. Only the classics and pretty books get to go on these shelves, and guess what- there's no more room! Twice a year we empty 1/3 of the shelves- everything at eye-level- for pottery display. We move the club chairs, the sofa, the rug out, and move the pottery in. Two large shelves plus bookshelves in the living room, the dining room table and another small self in the dining room. Pottery central. We have just moved the furniture back into place, but all of the pottery is still in the dining room. I need to inventory what I've got and what I need to make, organize it, and pack the ware back into their proper bins. In time for Thanksgiving. And I tell you, I am thankful. Life has thrown my family an enormous curveball or two this year, but I'm grateful beyond words for all of the good things that have come our way. I'll try to pop in on Wednesday and give you another peek at what's going up on Friday. Y'all have a wonderful week, won't you? an ode to southern food and a friend. Tomorrow we're having a memorial luncheon for a dear friend. She was a native of the Mississippi Delta, so we're doing it right. Do you know about the Delta? Or about Deltans? There's an old one-liner about about the Delta: "it's rainin'! Let's have a party!" I first heard that one from my friend Rayner. I've known lots of Deltans, and I have lived in Mississippi, and for all of the region's flaws and its frequently deservedly bad reputation, there is a strong sense of hospitality and making the best of any situation, turning it into a joy-filled event, even if the circumstances are not joyous. I lived in Mississippi, and I'm a strong person, but I'm not a Delta girl. They're made of stronger stuff. On the menu: Chicken Salad (with nuts), Vichyssoise, Tomato Aspic (my contribution), Cucumber Sandwiches, Fig Cake, Champagne (lots), wine (lots), and some beer. And lots more food that I can't even remember. And y'all, this is what I love. The luncheon is at our church. I'm so happy at such times (at all times, frankly, as I'm a convert) to be an Episcopalian- that we can enjoy our friend's memory, with libations, at church. Rayner was our crucifer for many many years- and she was an extraordinary caterer. Church, food, and wine were important to her. They are important to me. My friend Rayner was such an encourager. She encouraged me to become active at our church. She encouraged me to really pursue pottery. We shared a love of McCarty Pottery. She was the epitome of hospitality. If someone was ill- she took food. If someone had a special occasion- she took food. She brought artichoke dip for all of my early pottery sales, and often stayed to help close down the first night- chatting up customers, pouring wine (for she was a Delta girl, after all), and buying a special piece or two to use in her catering business or for a friend or family member. She was a "doer." Not one to sit back. I'm having a hard time with her death. I'm so glad that she's not struggling with cancer anymore. She fought hard for 3 years and outlasted 90% of esophageal cancer patients. But I miss her. I miss who she was before she was sick. I miss who she was in the midst of her sickness. But I'm happy to help honor her tomorrow in the ways that I can. I am a worker- she was a worker. I'm working through it. I'm celebrating her life and honoring her memory by helping to throw a party. If you have a little drink tomorrow, on Wednesday- of wine, tea, or even water, send up a little toast for my friend Rayner, will you? I will too. I pulled these out of the kiln this morning, anxious about how they'd look. I am so, so pleased with them. The idea of a series of birds' egg vases has been percolating in the back of my mind for several years. I've finally come up with a glaze combination and shape that I like. One of them is a gift for my friend Lynsey's birthday (the one in the front right). Another is already sold. I'm about to go up to the studio to throw- you can bet I'll be making more of these. This morning I woke up early and went on a quick run despite the cold. April has fled the mid-south and been replaced by a few days from February. It always amazes me how much more productive I am when I run in the morning. So far I've unloaded the kiln and photographed a bunch of things, made hummus, loaded the dishwasher, sold some pottery, and started a pot of spicy lemon-ginger-carrot lentil soup. All by 10 am. I hope my morning in the studio is as productive. I don't send very many Christmas cards- I rarely send them to "in-town" friends because I usually see them during the holidays. My family's cards go mainly to old friends and infrequently-seen family who are out of town. I had my idea for this year's card before thanksgiving, but I only finished making them yesterday after getting inspired by Maya and her lovely recycled paper bag stationery. 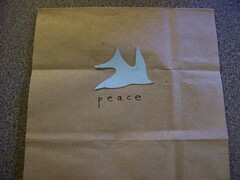 If this little dove image looks at all familiar to you, it would be because it is the same little bird stamp I use in my pottery and St. Francis icons. I also have some green paper I intended to cut an olive branch with, but I've simplified. After making my prototype with a paper lunchbag, it was a mite too thin to actuall write on- all of my favorite pens bled through the paper. Yesterday I found some 100% recycled kraft paper to use, instead. I hope that the recipients will, in turn, recycle the cards after the holidays. Last night I had the pleasure to meet Becca Stevens and two of the women of Thistle Farms, a non-profit business operated by the women of Magdalene in Nashville, TN. Magdalene is a residential treatment and recovery home for women who have survived life on the streets - survived prostitution, addiction, violence. I am rarely at a loss for words, but the realities of these women's lives- fleeing the worst of all possible realities and living into new beginnings- leave me both dumbfounded and completely inspired. I bought several of the all-natural, high-quality, 100% handmade bath, body, and home products for myself before their presentation because I could not resist the beautiful lavender and refreshing tea tree-mint fragrances. Today, I'm going back to buy more as holiday gifts for my family. All sales proceeds go back to support the residence of Magdalene. 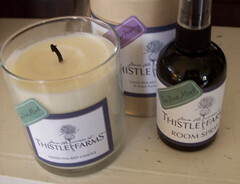 I rarely feel the need to endorse products, but I hope that if beautiful, natural bath and body items are on your holiday list, you'll check out Thistle Farmsand support these women. Weeks and weeks ago little boy told me that he wanted to be a rocket for halloween. Okay, I thought, that's better than the "harvester" he wanted to be last year (he ended up being Bob the Builder because we had the stuff and that's what he was the year before, too). A harvester? Like a combine? Yes. As in "Frank" the Harvester from the Pixar movie Cars. So a rocket was do-able. Especially since Gary had gotten this earlier this summer. So I drew this little sketch to see what he thought, and then I sat on it for three weeks. Or more. The deadline is here. Friday morning is the halloween party at school, and I have to work (I'm going to be Frida Kahlo), so we laid out the mylar foam last night, roughed out a costume shape with sharpie marker, and I started thinking. I have a large bin of old wool sweaters and skirts from thrift stores that I've felted down for various projects. Those came in handy. I sewed up the shoulders and the sides (my sewing machine doesn't like to sew on foam, as I learned, so I put newspaper under the bottom piece so that the feeder teeth would actually, you know, feed). I cut out red and orange felt triangles for the flames at the bottom, red, white, and blue felt for the lettering and the star/planets that decorate. I glue-gunned those on, as sewing with a needle and thread meant that I repeatedly stabbed myself and bled all over the costume. But now it's finished, and we're mostly happy with it. I decided to dress as Frida Kahlo for work. I've been so busy lately that I don't know if I'm coming or going, which leads to infrequent blog posts, and infrequent pottery action. 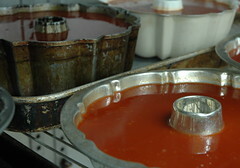 I fired the kiln on Sunday but haven't even peeked in to see how the bisque fire went. I'll figure that out this weekend, after the halloween festivities. well, the cat's out of the bag. I put this picture up on flickr, knowing full well that the woman I made it for would see it. And she did. And she's happy with it. Usually I stick with ferns, ginkgoes, and japanese maple leaves for my leaf impressions, but my friend Naomi said she thought that sea oats would work well in the same application. I decided to try it and gift the results. I've been gleaning ferns from her garden for a couple of years, mostly because my dogs wallowed in any shady earth in my yard until it was (and still is) as hard-packed as concrete. Not ideal growing conditions. I was hesitant about this motif because my great-grandparents had Homer Laughlin's wheat dishes (the golden colored, gold-rimmed ones), and I never liked them very much. I've been trying to figure out why I didn't like them, and I think it boils down to something very simple. I'm much more of a woodland kind of girl than an open-prairie type. Which explains why, on trips out west, to Austin, Colorado, Southern California, even the beaches of the east coast- I FREAK OUT. I need the trees, the shade, the anchor that they provide in the landscape, and the ferns that grow in the shade. Memphis is covered in a dense canopy of green (Naomi is fighting to preserve some of that green space in Memphis), and it is something I need to feel at rest. The sea oats are a huge thank you to the woman whose garden I regularly plunder. And even though they were SO much easier to paint, I'll be getting back to the ferns shortly. Because I'm a woodland kind of girl. Edit- This is the china pattern my great-grandparents had. In the end I decided to add a small serving bowl to the platter- because Lisa is such a dear friend. I "bowed it up" (when I married, the store that many of our gifts came from would call me-it was a small town- to come pick up a gift. They would always ask me if I wanted them to "bow it up" before taking it home) a bit with some of the passionflowers that take over the side of house. Turns out that she has not only a cake plate in this pattern, but another serving dish, too, so now she has a complete-ish hostess set. Which is appropriate for her, she is a gracious entertainer. This green came out looking a lot like McCarty's jade (except that theirs is matte), which pleased me. The rest of the greens that I glazed looked like this. It was initially disappointing, but over the course of the day the color was "rebranded" and I sold them all! Life is full of surprises, isn't it? Have I showed these to you before? I've been making them for almost 8 years- since I first started making pottery. Four-leaf clovers usually jump out at me- I can sometimes look down into a clover patch and see three or four of the lucky ones. These are some of my favorite little gifts, especially as a tiny happy for friends who are facing tough times and need a little cheer. I took a bunch of these to the farmer's market this weekend, and they certainly brought a load of luck with them- or maybe the fact that the market was the day before Mother's Day was just the lucky part. I didn't bring the big cup, and I left one of the little bowls at home, but the rest are gone! 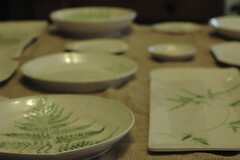 I sold almost all of my tiny bowls and did brisk business with the herb markers, mugs, bud vases, and even platters! I'll be back there on the 31st and will do a demonstration of how I make the herb markers. It has been such a busy weekend- with the market, Mother's Day, some good friends' late Cinco de Mayo party, and it seems like nine other things going on (including an early jump on the berry bowls! )- that I haven't put the market pictures on my computer. I'll do that this week- they'll be over at flickr. This is post 100 for me. I know who many of my readers are and am happy to call many of you friends, but I'd love it if the rest of you might consider de-lurking for me. Pretty please, I'm curious! If you'll comment on this post, I'll pick a random comment (little boy will pick a number from the total number of post by Wednesday, 5/14) and I'll send you a happy yellow tiny bowl. These are two baptismal banners I made for Easter Baptisms at the Cathedral. I was really excited about how they turned out. The entire thing is made out of craft foam sheets and really skinny ribbon. We traced the handprints of about 8 of the children in Catechesis of the Good Shepherd a week ago and I arranged them into a butterfly shape for the little boy, and a garden of lilies for the little girl. I was very pleased with how the ribbon looks a bit like calligraphy. The background is plain cotton duck canvas, which took hot glue and fabric glue really well. Little boy and I also made easter egg garlands and place cards for our dinner yesterday, but he woke up this morning with a bad tummy bug, so the family festivities will be postponed. I changed out of my easter clothes and dressed up like an easter egg- a powder blue cashmere turtleneck a Cathedral friend outgrew, pink mini-wale cords, and my favorite blue and purple jaywalker socks. It's beautiful out, but only about 50 degrees, a reminder that spring's nature is fickle. With all of the excitement about cupcakes in the blogosphere, I've been craving them this week, so when little boy fell asleep, I pulled out the kitchenaid and whipped up a batch of lemon cupcakes with buttercream icing. I'll save them for when little boy is feeling better, but the icing is the exact yellow of johnny-jump-ups, so at least a few with be flower-topped. Maybe I'll be able to get a picture of them with my favorite cake plate later this afternoon. Happy Easter- sing out, ring the bells, enjoy the renewal of spring! Earlier this winter it seemed like my life was turning upside down. I had three weeks of what seemed like nothing but bad news, but it was a vehicle for many people to show their love and support during my mini-crises. Lately, everything has more than leveled out- it even seems to be on an upswing. I need a new roof, suddenly we have the funds available for a new roof. I didn't get into my "sure thing" show I do every year, but sales picked up on etsy and amazingly, I just got an offer from an old friend to set up as a featured artist in a gallery she's helping run. I am so, so grateful, and excited about the potential for that day. These little bud vases were a birthday gift from a dear friend- I turned 33 on Palm Sunday and little bits of love have been trickling in my mailbox and front door all week long. The muscari are from my garden- I have planted hundreds of them and have happy deep blue drifts all along my flowerbeds and into the lawn. The tulips were a gift from another friend, delivered the evening of my birthday, after a long day of church and family egg hunts. Dear Gary got me that bamboo ring I wrote about a while back, and my mother is helping me with a giffin grip for the studio. It has been a good, full week with a festive, full weekend ahead. Happy Easter, happy spring.